UPDATE: Since the time of writing this post, Docker has become much more mainstream. Some of the APIs have evolved and there is also native installation options for Mac available (instead of boot2docker). The docker tutorials are the best way to get started, https://docs.docker.com/get-started/. In addition docker-compose is useful for spinning up groups of containers as demonstrated in this post. With the rise of new development methodologies such as Continuous Delivery, long gone are the days where a Software Engineer pushes code into the abyss and hope it comes out unscathed on the other side. We are seeing a shift in the industry where the traditional walls between Development, Quality Assurance and Operations are slowly being broken down, these roles are merging and we are seeing a new breed of Engineer. The buzz word “DevOps” has become prominent in the industry and as a result we are seeing project development teams that are more agile, more efficient and able to respond more quickly to change. This shift has led to a rise of new tools and frameworks to help us automate deployment, automate testing and standardise infrastructure. One of the tools at the forefront of this transformation is Docker, Docker is an open platform for developers and sysadmins to build, ship, and run distributed applications. Before diving further into this practical exercise I would suggest having a read over What is Docker? Before beginning the exercise you will need to install Docker, I use boot2docker on MacOS, for further details on installation for your platform visit Docker Installation. Another option is to use a cloud provider to run your docker host, Digital Ocean provide Docker ready servers running on the cloud for as little as $0.007/hour, this is an especially attractive option if you are limited by bandwidth or resources. A docker image is a read-only blue-print for a container, an example blue-print may be the Ubuntu operating system, or a CentOS one. Every container that you run in Docker will be based off a docker image. A Dockerfile contains code that tells Docker how to build a Docker image. Docker images are layered and so can be extended, this allows you to stack extra functionality on top of existing base images. A commonly used base image is ubuntu:latest which is a blue-print of the base installation of an Ubuntu distribution. A docker container can be thought of as a light weight self-contained instance of a virtual machine running a linux distribution (usually with modifications), they are extremely cheap to start and stop. Docker containers are spawned using a docker image, they should be considered as stateless/ephemeral resources. Docker Hub brings Software Engineering DRY principles to the system infrastructure world, it is a global repository platform that holds Dockerfiles and images. There are already images available that run ubuntu, redhat, mysql, rabbitmq, mongodb, nginx to name just a few. Let’s start by creating our MySQL database container, luckily for us MySQL has already been “dockerised” and is available for us to pull via Docker Hub, the defaults are fine so there is no need to write our own Dockerfile or build any new images. A new container can be started using the docker run command. The first run may take some time while images are downloaded, they will be cached for subsequent runs. Edit: Please note that in order to maintain any data across containers, a VOLUME should be configured to ensure data stays persistent. For the sake of simplicity we will omit this flag but be aware deployments that involve state should carefully consider the durability of data across the life-cycle of containers. Now let’s move onto running the WordPress application container, again this has already been “dockerised” and resides in the Docker Hub WordPress repository. 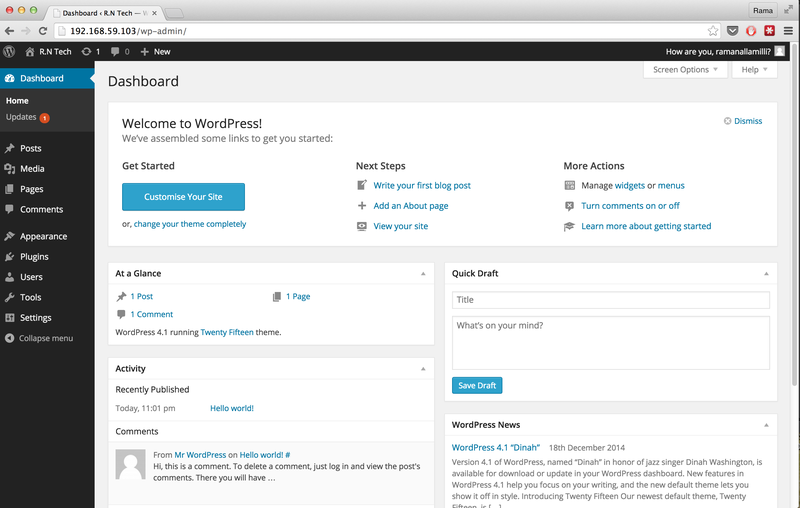 Excellent, the wordpress-app container can talk to the wordpress-db container. Exit the bash session, if desired you can check the logs for your running containers. Great, everything is looking good so far. 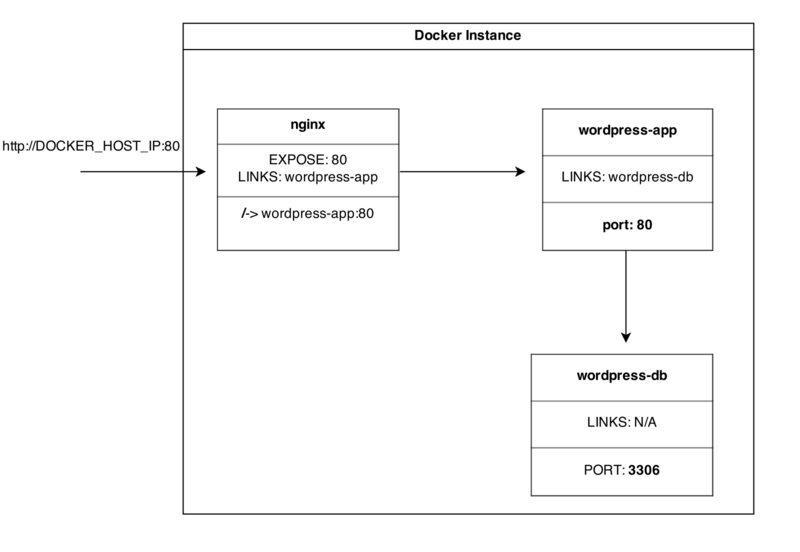 docker build -t wordpress-nginx . You may notice we gave the argument -p 80:80, this tells Docker to expose the port 80 on the container so it can be accessed externally from the docker host machine. So to recap, we have learnt some of the fundamental concepts of Docker by making practical use of the resources available in Docker Hub to build a self-contained running instance of WordPress. All with just a few Docker commands. I hope this post will serve as a good introduction for you to start Dockerising your own applications infrastructure and to reap the many benefits that Docker brings. If you enjoyed this post, I’d be very grateful if you’d help it spread by emailing it to a friend, or sharing it on Twitter or LinkedIn. Thank you for reading! I'm Rama Nallamilli, software engineer and brazillian jujitsu practitioner based in London, UK. I have a passion for technology and modern engineering practices. My blog will discuss topics across the whole spectrum of development but Scala, DevOps and Distributed Systems are subjects I am particularly passionate about. My previous experience includes working in engineering teams at the BBC, HMRC, Sky and Expedia. I am currently working as a Data/Software Engineer for Babylon Health, a UK leading startup in the A.I healthcare space. I spend my spare time training in Brazilian Jujitsu and currently hold a purple belt.